In case you were wondering if January was actually that good, a couple of pros whose job it is to travel the world in search of the best snow, testify they’ve just had their best powder trip ever. 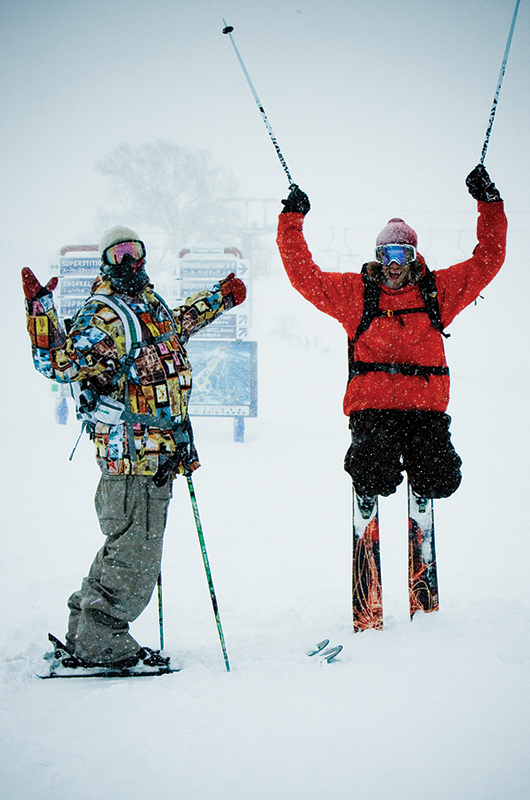 Armada Skis co-founder JP Auclair of Quebec, and California’s Chris Benchetler have been coming to Niseko every year for the past few years – including the bumper season 05/06 – and say they’ve never had such a consistent run of such good quality powder. “I’ve been skiing for 25 years and this is the best ever – every single day has been epic,” Auclair told us when we met them at Black Diamond Lodge where they were staying. He said his best ever trip before this was cat-skiing in Retallack in BC two years ago. After two weeks here he decided this trip was as good… that was before it snowed nonstop for the following five days. The crew stayed at Black Diamond Lodge in Higashiyama and wanted to make special mention of owner Clayton Kernaghan’s hospitality and for guiding them into such good powder. “He made this trip the best powder trip ever – the snow is one thing but for him to be so on top of it and take us to all these spots that were so good was awesome,” Benchetler said. Montreal cameraman Phillipe Benjamin documented the trip and said it would feature in a dedicated Niseko segment in his production company Poor Boyz Productions’ video Reasons coming out in September.